With the MTA moving forward on its "bus action plan," advocates want the city to act on its own. Mayor de Blasio must greatly expand dedicated bus lanes before his term expires in 2021 — and on Tuesday, he heard it from the people who know best: Bus operators themselves. 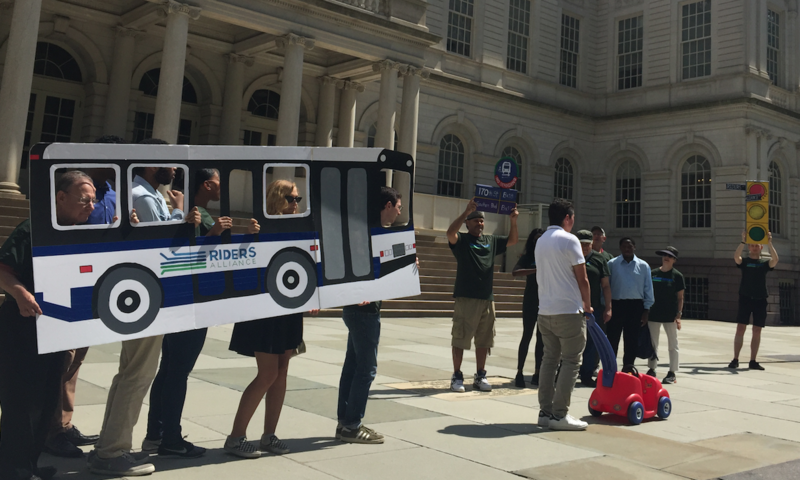 With bus ridership in free fall, MTA drivers joined other activists in the Bus Turnaround Coalition in a rally at City Hall to demand that the city address congestion, which is one problem it can’t fully blame on the state. Currently, the city has 120 miles of bus lanes. Activists want another 100 within five years, 60 before de Blasio moves out of Gracie Mansion. The call for city action comes after the MTA unveiled its “Bus Action Plan,” a multi-pronged approach to speeding surface transit that relies partly on the city to step up enforcement of bus lane blockers and add bus lanes, among other improvements. On Tuesday, the Bus Turnaround Coalition — comprising Riders Alliance, NYPIRG’s Straphangers Campaign, Tri-State Transportation Campaign, and TransitCenter — added its voice in the form of a “Fast Bus, Fair City” campaign [PDF] that also calls for improved bus lane enforcement and technology to give buses more green lights, known as transit signal priority. If Mayor de Blasio implements it, city bus speeds would improve to 11 miles per hour, up from 6.7 MPH, and the rate of buses arriving in bunches would decline to 5 percent, from more than 13 percent, the group says. Behind simply painting more bus lanes, the mayor has an essential role to play in ensuring they are respected and enforced. Ultimately, NYPD can’t be everywhere at every moment — true citywide bus lane enforcement requires cameras, which can only be implemented with Albany’s approval. The MTA is pushing for that legislation, the state agency has said. But the mayor can take steps to get city employees, taxis and other drivers from parking in bus lanes. He can also reform the city’s stipulated fine program, which gives delivery companies bulk discounts on parking tickets, so that delivery truck drivers are deterred from obstructing bus traffic. It’s not the first time the bus operators’ union has pushed for changes. In November, TWU and ATU Locals 1056, 1179, and 726, which represent drivers in Queens, called for the MTA to allow riders to board on all doors on every bus in the city. But the union’s participation in Tuesday’s event marked its most forceful recent endorsement of bus lanes and other improvements. De Blasio has said he supports the MTA’s bus action plan, but has made no major policy initiatives. In response to critics, the city has defended the pace of signal priority implementation and pointed to its route-by-route rollout of the Select Bus Service program. But Select Bus Service is “yesterday’s news,” said TransitCenter’s Jon Orcutt, adding that the city must bring the benefits of Select Bus Service — bus lanes, all-door boarding, and improved stop spacing — to every route in the city rather than just a few. “What Select Bus creates is worthy, but the program is not executed on a scale that meets the city’s needs today,” Orcutt said. What good are bus lanes if they aren’t enforced? The current implementation of SBS is half-baked and un-inspiring. Just a few NIMBYists always blocking the way of real progress for the masses. Yes because since they enforce 24 hour bus lanes in queens on woodhaven blvd. They have caused traffic to go up by 30-50%. One less lane and less chance of emergency vehicles getting on scene. Enough with these bike lanes, bus lanes. Widen the roads; build bridge crossing at busy intersections like las vegas has. This is all waste of money.